Home Accessories Four NEW Ways to Tie a Headscarf – Even More Vintage Glamour! 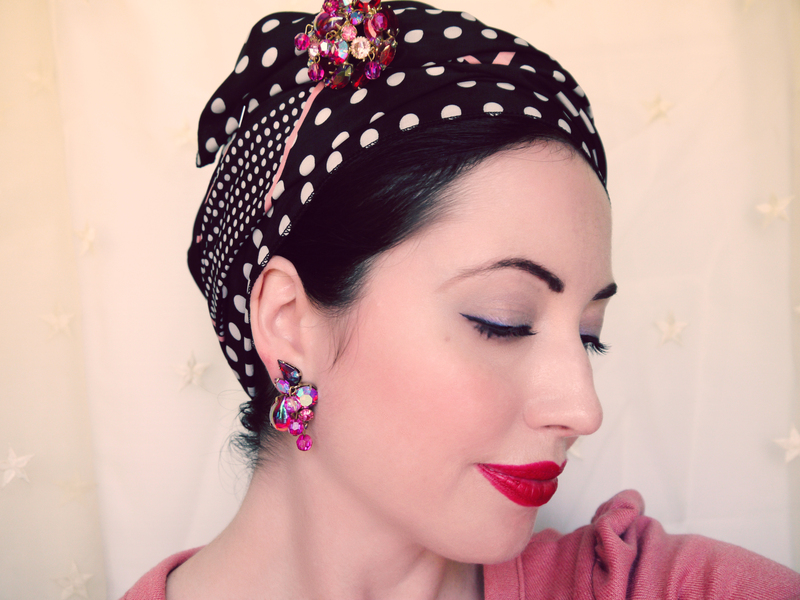 Four NEW Ways to Tie a Headscarf – Even More Vintage Glamour! 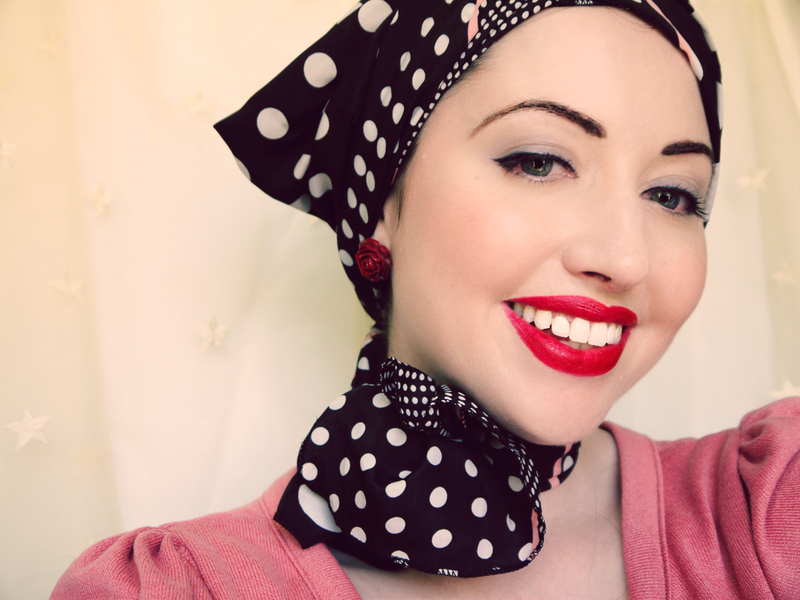 A simple headscarf can be tied so many ways it’s amazing! 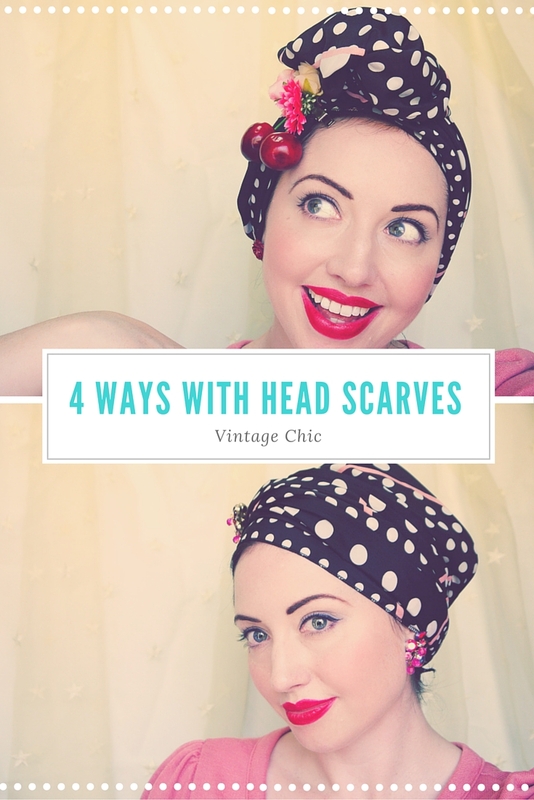 Following on from my previous tutorial on “How to tie a headscarf Retro Style“, this time I have 4 NEW ways to tie a headscarf! With our Melbourne Sumer currently hitting temperatures of 41 degrees Celsius, this heat inspired me to create some new looks that keep your hair totally out of the way. 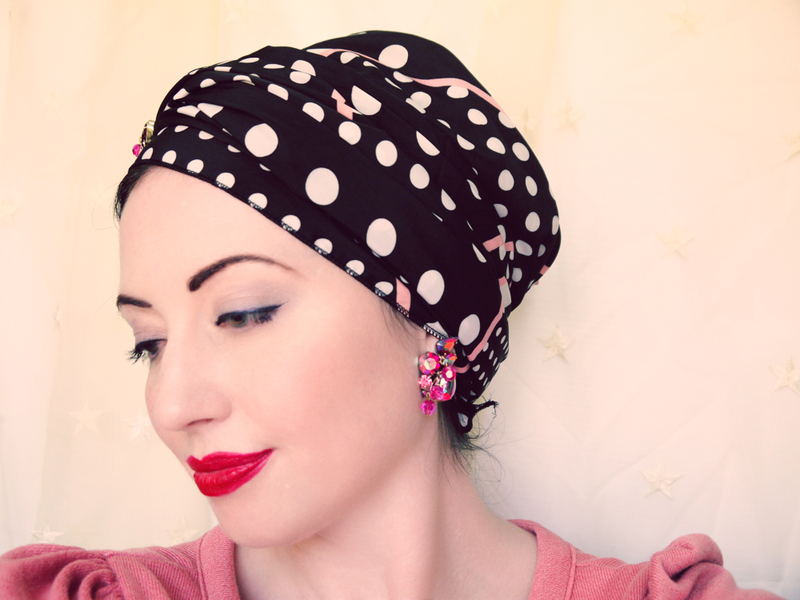 I’ve created this tutorial especially for those of you who are looking for headscarves that completely cover the hair, so it is perfect for those with hair loss and doesn’t rely on the scarf being pinned into the hair. Each of these looks was inspired by different hats from various eras; a 1930’s turban, a 1940’s beret, a 1950’s headscarf and neckerchief, and a 1960’s pill box hat. After a few hours in front of the mirror with my trusty long scarf, a few dress makers pins, jewellery for accenting and even some hair clips; I’ve created some truly new and unique ways to wear your scarves. And don’t worry if you don’t have one this big. Simply drop into your local fabric store, choose a pattern you love and ask the staff to cut it to the same dimensions. The scarf I’m using in this demonstration is a long scarf I bought when I was in a bind at the airport, having misplaced my sweater, and needing something to work as a wrap too. Dimensions – 67cm wide x 174cm long or 26.5 inches wide x 68.5 inches long. Next articleMy Middy Hair Cut. 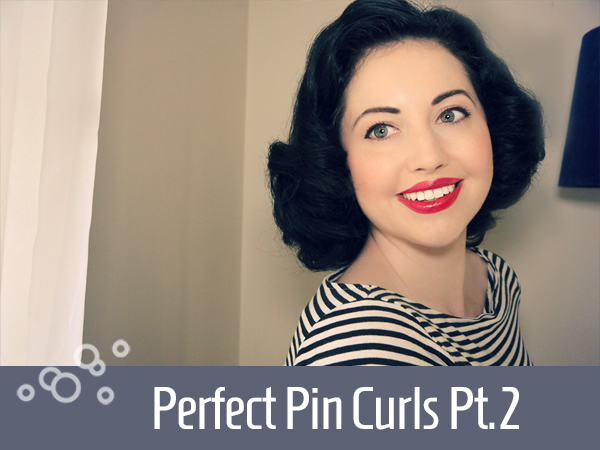 The Perfect Cut for Vintage Sets. 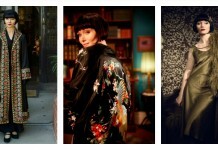 I love this video Candice, the four styles are very different & relatively easy! it’s also fit for our environment in Saudi Arabia ( as Muslims) to do it . Zahra: Thank you so much! I know I have a lot of Muslim fans, especially in Malaysia. It’s always lovely to hear from people around the world with a different take on things. 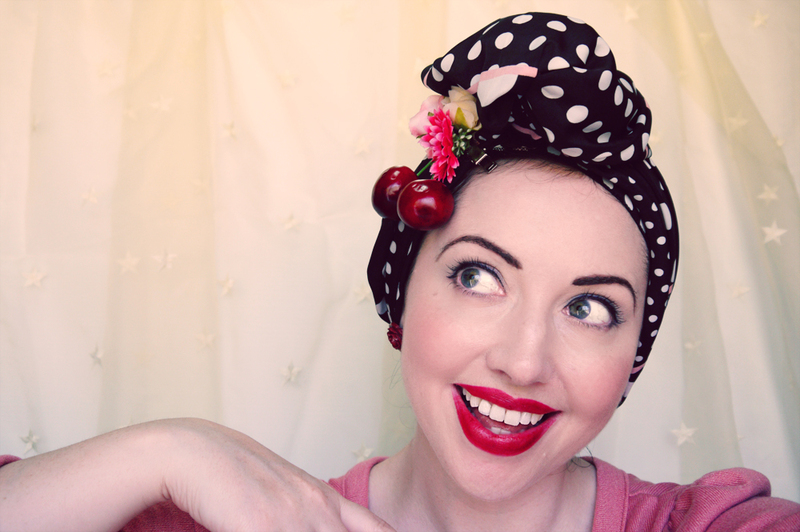 I’m filming a new headscarf tutorial again in the next week or so. Hi I would just like to inform you that your video tutorials are fantastic. I have currently lost all of my hair due to having chemotherapy and I am 28 year old female… I have been really struggling to feel feminine and struggled to have ideas on how to wear scarves and bandanas so I have just been wearing plain black wooly hats. but thanks to your videos I have just done the top knot look and I really feel feminine again 🙂 thank u very much keep doing what your doing as it does help people whether or not its just for fashion or fun! I will be trying these! I am so happy to have found this page! I actually saw one of your pictures on “a different blog” and had to do a dozen google image searches to find where it actually came from! boo for them not linking it!